thought he had hit #3000 on September 29, 1972, as he safely beat out a ball that never left the infield at Three Rivers Stadium in Pittsburgh. But the official scorer ruled that Mets second baseman Ken Boswell erred on the play and Clemente went hitless the rest of the game. 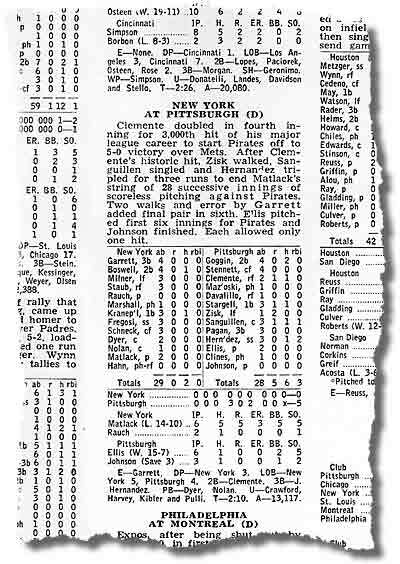 Clemente's historic hit came the next day as he sparked a fourth inning Pirate rally with a double off Met pitcher Jon Matlack. It was Clemente's final at bat of the season and, tragically, the last of his careerthe Puerto Rican hero perished in an airplane accident during the off-season. Clemente was a stellar defensive right-fielder, winning the Gold Glove Award 12 times. The next big leaguer to join the 3,000-Hit Club was also known for his defensive prowess in right, garnering 10 Gold Glove Awards over his 22-year big league career. His name: Al Kaline.